There has been a surge of mobile apps in the last few years and are transforming several aspects of our personal and professional lives. From messaging apps to the apps for booking cabs, shopping, or ordering food, all kinds of apps are being created to make lives easier while generating huge revenues in doing so. According to Statista, it is estimated that mobile apps would generate approximately USD 188.9 billion in 2020. 2018 has been a hot and happening year for the mobile apps market. 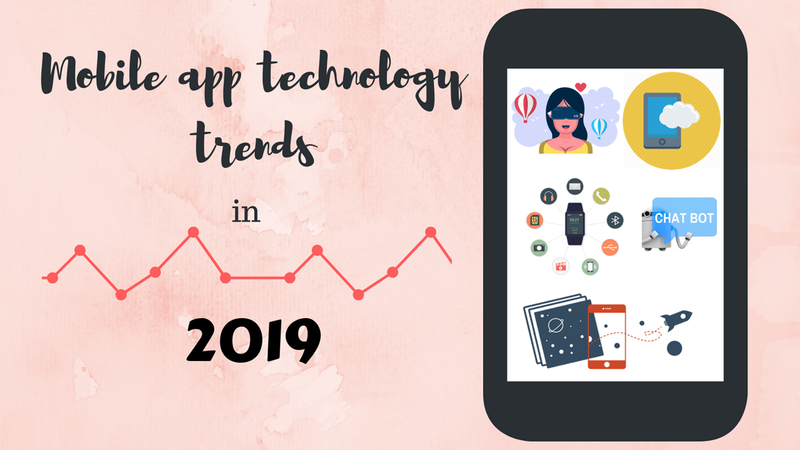 Based on the latest developments and ongoing trends, what can we look forward to in 2019 in the mobile apps market? IoT has been a rage in recent years and is ascending further rapidly. Businesses across the world have started to realize and leverage the power of interconnected devices. The latest developments in the IoT space have given us the power to control a variety of devices using our smartphones. Smart devices connected through sensors and software within a network serve a wide range of purposes by continually exchanging data. A significant disruption in the coming year is going to be the application of IoT in mobile app development. More sophisticated mobile apps which will expedite operations, reduce expenses and enhance cybersecurity will become possible. Among industries, healthcare will be one of the early adopters of IoT for mobile apps. AR and VR are futuristic technologies that can deliver a more realistic experience to the users. The use of AR/VR is extensive in the gaming space. And marketers, in particular, have understood the potential of this technology and have been using it to promote their campaigns and target their customers in a more effective manner through mobile apps. In 2019, more businesses can be seen including AR/VR technology to establish deeper engagement with the customers and expedite the buying process. As the focus on social media campaigns increases, mobile apps will be developed with elements of augmented and virtual realities to make them more playful and interactive. With their integrated AR filters, Instagram and Snapchat are the forerunners in that area. Chatbots can design a more effective self-service framework which provides the users or customer with personalized responses to their queries in real-time. Initially, the use of bots was limited to messaging apps like Facebook, Slack, Skype etc. However, advancements in AI have made it possible for organizations to integrate chatbots into their native mobile apps. In the last few years, Chatbots have proven to significantly improve the functionality of mobile apps. They increase user engagement with their conversational interface and drives app adoption across the organization. The specialty of a chatbot application in mobile apps is that with each user interaction, the app will only become more accurate in its responses. The many advantages that the chatbots can bring to mobile apps will be a catalyst for chatbot application in mobile app development in 2019. AI has been and will continue to be a dominant technology trend in the coming decades. Despite being there for quite some time, AI still has several aspects that are yet to be explored to make businesses realize its numerous benefits. Recently, the AI implementation and machine learning applications have been coupled. It has shown highly impressive results in analyzing massive amounts of organizational data to equip the management with valuable actionable insights. AI and machine learning can enable developing smarter mobile apps that can find the reasoning behind information to deliver a more personalized experience to the users. We can expect AI and machine learning to redefine the mobile app development process in 2019. User convenience is a deciding factor in the success of a mobile app. Instant apps are made to do just that. After Google first introduced them in 2016, their popularity has grown over time. In basic terms, instant apps are native mobile apps that you are not required to download and install on your phone. They provide the basic functionalities of a website and are smaller in size compared to regular apps. So, they deliver a great user experience without consuming much of your phone’s memory. Instant apps are easy to use and can be easily shared with friends. A few examples of instant apps are New York Times Crossword, Red Bull TV and Skyscanner. We can see more instant apps emerging in 2019. It won’t take too long for wearables to become a must-have accessory. There has been a considerable rise in the sale of wearable devices over the last few years. More people are focusing on personal health management, and wearables help them track their progress by constantly updating them on vitals as calories burnt, heart rate, blood pressure etc. These devices also provide sleep pattern information and water intake reminder and help them follow a healthy lifestyle. They have also become a style statement. There is an increased awareness among people pertaining to lifestyle and personal health. These devices require an app to function and hence there will be a significant rise in the number of healthcare apps in 2019, especially as wearable technology becomes more cost-effective and affordable. The way consumers are shopping and making payments is changing gradually. Earlier, the mode of payment switched from cash to cards and now the trend is moving towards mobile payments like Paytm and Google Pay. According to ResearchAndMarkets, the mobile wallet market in India is expected to be USD 7 billion by 2023. These payment apps help your smartphones assume yet another crucial role. Factoring the ongoing progress in the adoption of mobile commerce and consumer preference form-wallets, more mobile payment apps can be seen joining the bandwagon in 2019. Apple Pay could be one of them. The blockchain is one of the biggest technological disruptions in recent years. It has brought forth an extraordinary level of security and transparency in all types of digital transactions. Once majorly known by Bitcoin, blockchain quickly got adopted in the financial services industry and supply chain applications. This decentralized ledger keeps a record of every transaction and also makes the records impossible to breach. Businesses across industries like retail, financial services, and healthcare are looking forward to leveraging blockchain in building their mobile apps. It is one of the top trends to watch in 2019. Mobile apps are providing solutions to some long-prevailing problems and have been helpful to better several aspects of our lives. The above trends are the evidence of the huge traction that is being generated in the area of mobile app development. These developments hold promise in solving some grave challenges and enabling efficient workflows. It’ll be exciting to see these trends unfold and impact everyday mobile apps.